SRG’s Metallurgical Testwork Under Way. Piloting and Bulk Samples on Its Way – SRG Graphite Inc.
Montreal, Quebec, September 24, 2018 – SRG Graphite Inc. (TSXV: SRG) (“SRG” or the “Company”) announces today that SGS Canada (Lakefield) (“SGS”) was selected for metallurgical testwork, flowsheet validation, piloting testwork, and bulk concentrate production for the Lola Graphite Project in Guinea, West Africa. Metallurgical testwork began a month ago, and bulk concentrate production is set to begin in the coming weeks. The testwork is conducted on a 1.5-tonne representative sample of mineralized material from the deposit, under the supervision of Oliver Peters of Metpro and Volodymyr Liskovych of DRA. This testwork will be completed by the end of Q4 2018, and its results will be key inputs in the process design for the Lola graphite plant. An additional 200 dry tonnes of mineralized material from the deposit is currently on its way to SGS for concentrate production. Once produced, several tonnes of graphite concentrate will be available to the Company, ready for shipment to prospective clients as part of its sales strategy. Intermediate concentrate will also be produced and sent to suppliers as part of the vendor tests to further increase confidence in the equipment selected in the feasibility study. 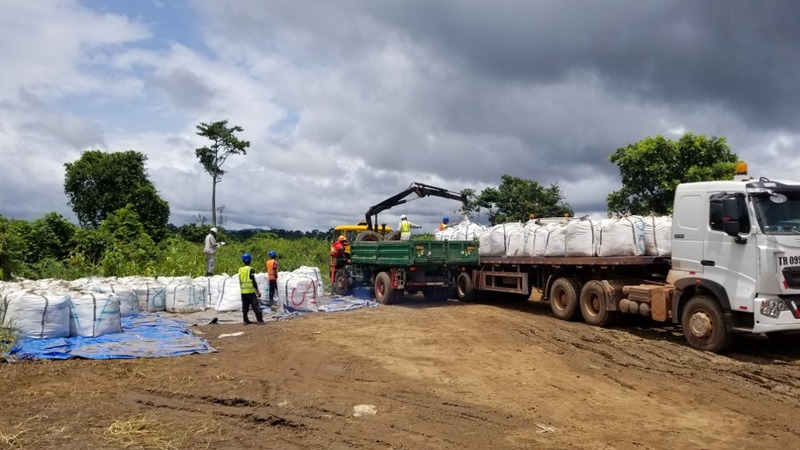 The 200 dry tonnes of mineralized material departed Guinea, via ship, in early September and is estimated to arrive in Lakefield by late October. The Lola Project Team putting the 200 tonnes of mineralized material on the truck towards the Conakry port. SGS Canada began in 1948 as a specialist provider of services for the agricultural industry. Today, their operations across Canada have rapidly evolved into a highly technical service provision and are known across the world for excellence in exploration and mining. This press release contains “forward-looking information” within the meaning of Canadian securities legislation. All material contained herein that is not clearly historical in nature may constitute forward-looking information, including references to the plans and project of the Company, such as proceeding with production at the Company’s Lola Project or proceeding with exploration activities on its permits, including Lola and Gogota. Generally, such forward-looking information can be identified by the use of forward-looking terminology and phrases or can state that certain actions, events, or results “expect,” “may,” “could,” “would,” or “might.” Forward-looking information is subject to known and unknown risks, uncertainties, and other factors that may cause the actual results, level of activity, performance, or achievements of the Company to be materially different from those expressed or implied by such forward-looking information. Forward-looking information is based on assumptions management believes to be reasonable at the time such statements are made. Although the Company has attempted to identify important factors that could cause actual results to differ materially from those contained in the forward-looking information, there may be other factors that cause results not to be as anticipated, estimated, or intended. There can be no assurance that such forward-looking information will prove to be accurate, as actual results and future events could differ materially from those anticipated in such forward-looking information. Accordingly, readers should not place undue reliance on forward-looking information. Forward-looking information is given as of the date of this press release, and the Company does not undertake to update such forward-looking information except in accordance with applicable securities laws. Additional information on these and other factors that could affect SRG’s operations and financial results are included in reports on file with Canadian securities regulatory authorities and may be accessed through the SEDAR website (www.sedar.com).